This tutorial covers the topics on obtaining information from the internet page by using Python. First of all you will learn how to Python setup for Windows briefly. 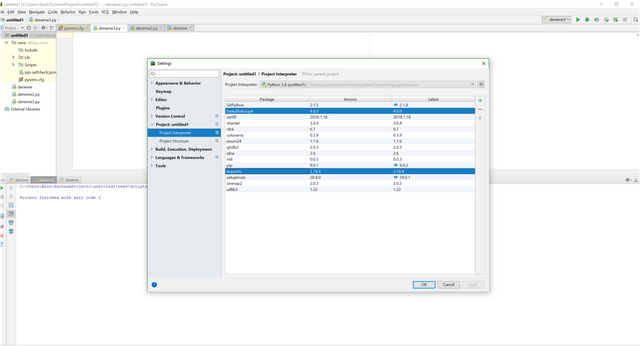 Then, you will learn how to PyCharm which is a program to use Phyton language briefly. 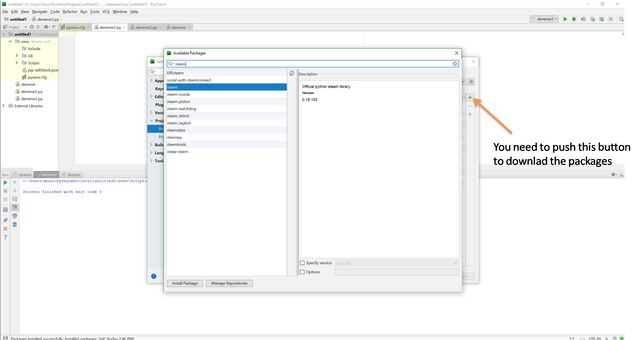 Then, you will learn how to add packages for Python by using PyCharm program. Then, you will learn how to import the packages briefly. Then, you will learn how to use for and if statements briefly. Then, you will learn how to obtain information from the internet page. Then, you will learn to get some information from Steemit member page. 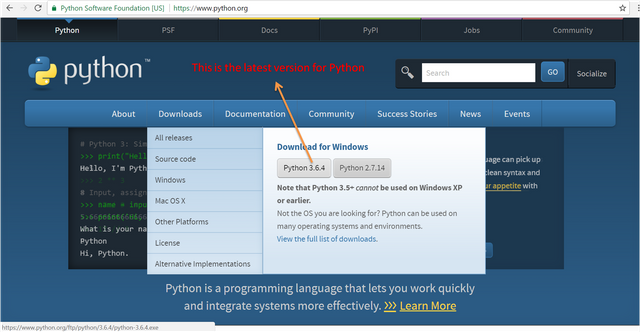 For this tutorial, you need Python 3.6.4 (actually you do not need newest version but always updating the Python is useful for you.) 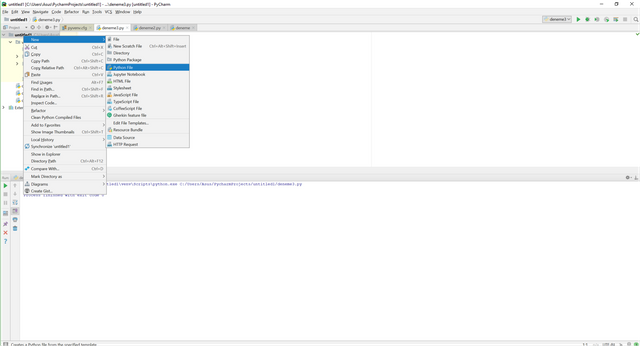 and PyCharm program. For Python 3.6.4 => you can download here for free. 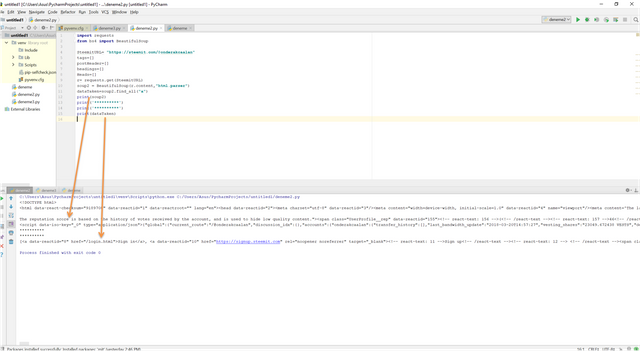 For PyCharm program => you can download here for free (30 days trial). This tutorial has an indermadiate level. 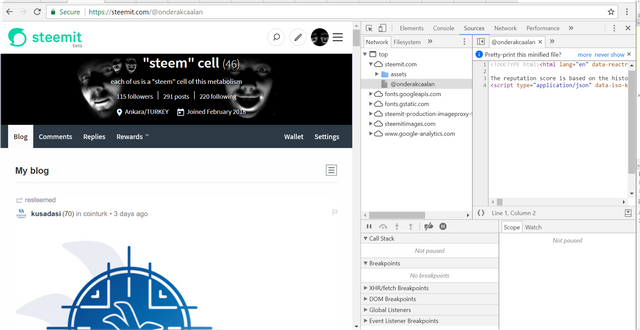 We want to build a program to make an analysis for Steemit members such as personalized tags, blog headings, wallet etc. Today, we will show how you can take information from a website by using Python. 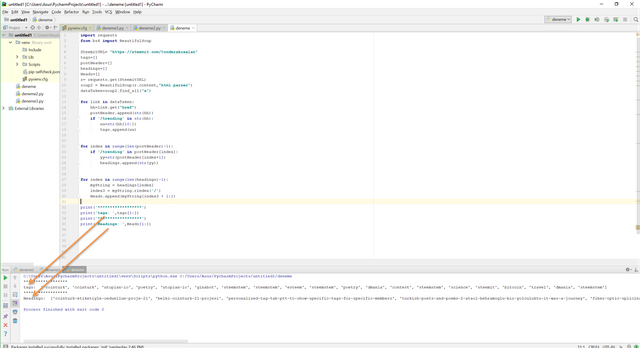 After setup Python and PyCharm program, you need to open PyCharm program and the design will be like this and you can create files by right clicking the folder which is named untitled1 for us. Then you need to choose new and then Python file. After giving a name for file you are ready. Now, you are ready to write your code in Python. Before starting to write the codes we need some packages which is written programmers and we can use these packages for free. We like Python due to its open source. Also you can create your packages and you can advertise it. Anyway, let's learn how to download packages. You need to choose File>Settings then there will be a pop-up menu which is related to general settings and also Project Interpreter menu. You can see the dowloaded packages and also you can add all packages here. 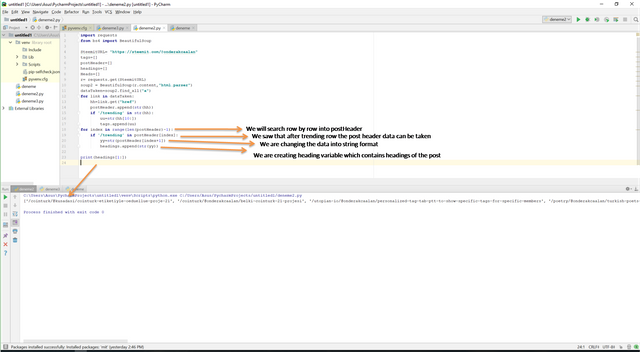 For our tutorial we need to dowload beautifulsoup4 and requests packages. We want to skip some basic learnings such as math operations, strings, variables, print etc. Also we think that with a written program you can learn a program much more easier. To achieve our goal for this tutorial, we will use two important operations which are for loop and if statement. We will explain these operations also into the code. First of all, we need import the packages which we need to use in our program. You can see, we have data which contains "<a". As you see we have the headings. Right now, we have really easy job to clean and get exact headings. When we check the headings variables, we see that after last "/" character our wanted data which is exact heading is started in each row. 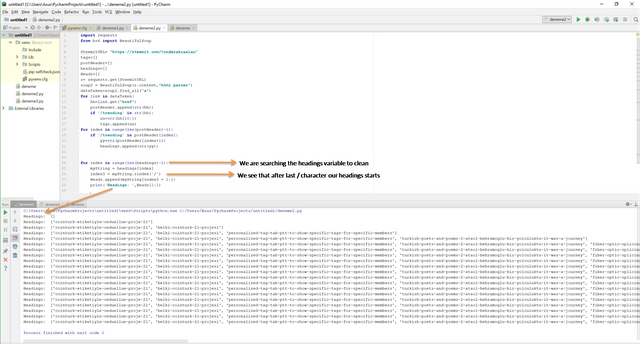 Therefore we searched each data in headings variable and get the data, here. When you start the whole code you will see this. You can extract all data form the websites, these are just an example (This can be seen simple code but we want to show what can be done.). In the future, we will make website to see real time data flow and analysis on Steemit . you are only printing the data you've fetched from the webpage. 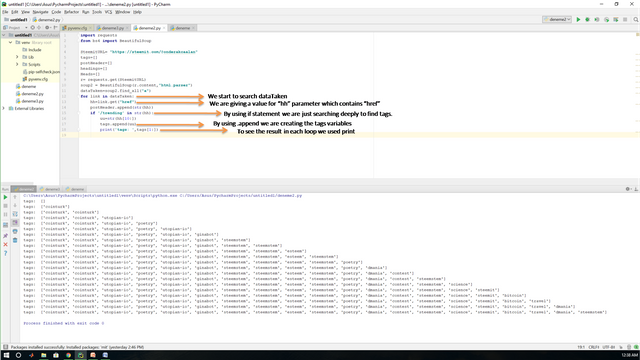 The minimum you could have done is wrap a more modular function around some bs4 code and return useful data from it. Anyway, you are hereby strongly encouraged to seriously upgrade the quality of your next Python tutorials. Hey @scipio, I just gave you a tip for your hard work on moderation. Upvote this comment to support the utopian moderators and increase your future rewards! Thanks for your encouragement. We will try to explain the issues according to yout comments in the next tutorial. Also we are very happy and appreciate to see such a serious comments from you. We are newbie among you but we will improve ourselves and our posts, be sure. First of all, I noticed that @arcange stopped the giving the analysis for the Steemit. I'm not sure to understand what you are talking about. Can you elaborate on what I stopped to do? Sorry, maybe we misunderstood but in this webpage which belongs to you, https://steemsql.com we think you stopped giving information about Steemit data without any payment. We want to say this issue. If we make a mistake about you, really sorry. The fact that the access to SteemSQL is no more free does not mean it has stopped to be available. What I am providing with SteemSQL is an access to a database and not an analysis service. Your comment is misleading and confusing. And now, some feedback about the content of your post. Your approach might not be the best as you are extracting data from information displayed on a website. Many information available in the blockchain are not available on the UI. Then, have the owner of the website change its design, your code might fail. You are right, i will delete about your part. You are right also about code, but this is just an example for tutorial to explain some package, and other stuff. Adamın dediklerini dikkate al iyi gidiyorsun! Hey @onderakcaalan I am @utopian-io. I have just upvoted you! Congratulations @onderakcaalan, this post is the forth most rewarded post (based on pending payouts) in the last 12 hours written by a Newbie account holder (accounts that hold between 0.01 and 0.1 Mega Vests). The total number of posts by newbie account holders during this period was 3218 and the total pending payments to posts in this category was $1524.06. To see the full list of highest paid posts across all accounts categories, click here. Congratulations! This post has been upvoted from the communal account, @minnowsupport, by onderakcaalan from the Minnow Support Project. It's a witness project run by aggroed, ausbitbank, teamsteem, theprophet0, someguy123, neoxian, followbtcnews, and netuoso. The goal is to help Steemit grow by supporting Minnows. Please find us at the Peace, Abundance, and Liberty Network (PALnet) Discord Channel. It's a completely public and open space to all members of the Steemit community who voluntarily choose to be there.